Jamie has gone to Lawton for the weekend. It's been years since she left me to my own devices for a trip not involving doctors. I do not know what she is doing in Lawton. I am hoping it involves a great deal of fun. I dropped Jamie at the airport and, immediately, I realized I had no idea what to do with myself. It's been, really, since May of 2002 that I have been faced with nothing to do in a town full of people I can actually call. But first I headed for Austin Books. One must always seize the chance to wander the vast aisles of Austin Books when one gets the chance to do so with no one in tow (who will inevitably get bored of seeing you pore through bagged and boarded back-issues of "Superman's Girlfriend: Lois Lane"), or without anyone worrying about when you will return for supper, etc... It was just me and those endless longboxes of lovely, lovely comics. I bought only one new comic, picking up a handful of back issues (I got a good deal on Superman's Pal: Jimmy Olsen #133 in decent condition) and Will Eisner's "Life on Another Planet". The one new comic was "Apocalypse Nerd" #4. One day, remind me and I'll write about this series. In the meantime, this is a comic every knob like me who makes a living working in front of a monitor should pick up. I admit, I go into giddy comic-fan sensory overload everytime I walk in the door of Austin Books. I enjoy my usual weekly trip to my local comic shop, but as well-run as I find my LCS, the shop simply doesn't treat the history of comics with the same reverence, it doesn't treat the artists like artists to be studied, it doesn't look at the medium as an artform in quite the same way. Back-issues at my LCS are not preserved pieces of pop-culture, they're old stock which needs to be taken off the shelf, like potato chips or twinkies. It's not that my LCS manager doesn't have an understanding of these things, or that he doesn't have an appreciation for comics. I think he's actually a very good manager. But he can't afford to take the chance on stocking the items he might want to put on the shelf as his audience is far more interested in what's new, what just came out, what's the latest...? The story behind the comics doesn't hold a candle to the story contained within the comic. And that's kind of too bad. I like a somewhat scholarly approach to the medium. I like knowing I can walk in and pick up a book of interviews with the early creators of JLA comics, or a Wally Wood retrospective, or a Terry and the Pirates Compendium as readily as I can pick up this month's issue of "Super Teen-Aged Misfit Vigilantes". I'm glad someone just got Pekar's latest in paperback. But I'm also glad they're across town. Otherwise, we'd be dead broke. Jamie reads my comics, but she doesn't collect them. I have bought Jamie her first back-issue. It is hers. It is not mine, and I will not put it in my long-boxes. I want her to have it so she has one, shiny, pretty comic which she can say "that is mine". I thought I'd spend this evening alone with the pets, but I didn't. I bugged some folks, but was having trouble finding someone to amuse me when Jason called. Thus, Jason, Mandy, Ellie and I wound up on S. Congress at Southside Flying Pizza, then at Jason's for a quick beer. Mel and Lucy came with me to the Hop-a-Long Lounge where they romped in the breezy weather with Cassidy. It is now windy and cold out. I wonder if Fall is finally fallen. Tomorrow I think I will try to summon folks to my house to watch the UT game and have a drink or two. We are having an all-faiths and creeds Holiday party. Be there. Here's some details to help you get the shin-dig on your Holiday schedule. Tomorrow Jamie heads off for Lawton, OK. She's going to spend some time with her folks without The League tagging along and shooting his mouth off for hours at a time. I am, of course, excited about Jamie's visit to her parents, but it's always dicey leaving Jamie to talk to her folks without being in attendance. Nothing bad, per se, ever happens. BUT, I know that in five months Jamie will say something like "My parents are coming down Saturday for that monster truck pull you're signed up to drive the Forester in." And she will say "The monster truck pull you agreed to be in. Remember?" And then she will roll her eyes. I will not remember any of this, so I will say "When did I say I would drive the Subaru in a monster truck pull?" And she will say, after sighing loudly, "When I went to my folks' house, and I came home and said 'my folks want to come down for the monster truck rally in March', and then you said you'd drive." "Maybe I meant I would drive to the tractor pull," I will say, still not really remembering this conversation. "Well, you said 'I will drive', and now you're signed up to drive in that rally.". To which I will say "I said that?" And she will assure me we had a conversation of which I recall no detail, but from which I think I misunderstood the questions, but, nonetheless, am now in motion to drive my V4 in a monster truck rally. These days, The Admiral no longer asks questions and just sort of goes along for the ride to an endless string of events that he cannot remember agreeing to attend. It's just better if I am there to know what I am agreeing to. The other day Jamie and I were walking through the aisles of Target when we came upon the 2006 Jones Soda Holiday Collection. You may recall the 2005 Jones Soda Holiday Challenge. I'm not sure that things didn't go according to plan, but I can say that it didn't make Christmas any better. I paused in the aisle, read what the flavors were in the this year's offering. I think it's worth noting that Jones Soda has, this year, included both "peas" and "antacid" in the flavor mix. But I'll never taste them. At first, I was a little like "Ha! That was great fun last year! We should do it again!" But then Jamie reminded me of the grueling pain I'd felt in my gut, and the multiple times I wasn't sure if I would boot or not in the sink. Apparently I also left myself a little message, to prevent exactly this sort of thing from happening again. So, no Jones Soda taste test for me this year. ANNOUNCING THE LEAGUE of MELBOTIS 2006 HOLIDAY SPECTACULAR!!! Hey, Leaguers. We've been living out of town for a while. Some folks might say, too long. But we're back, and happy to have returned to the city that wore a violet crown. After much pondering, we've decided that nothing says "we're glad to be back" like opening your doors to your friends and providing a veggie tray. And what better time of the year to show a little hospitality than during the Holiday Season? 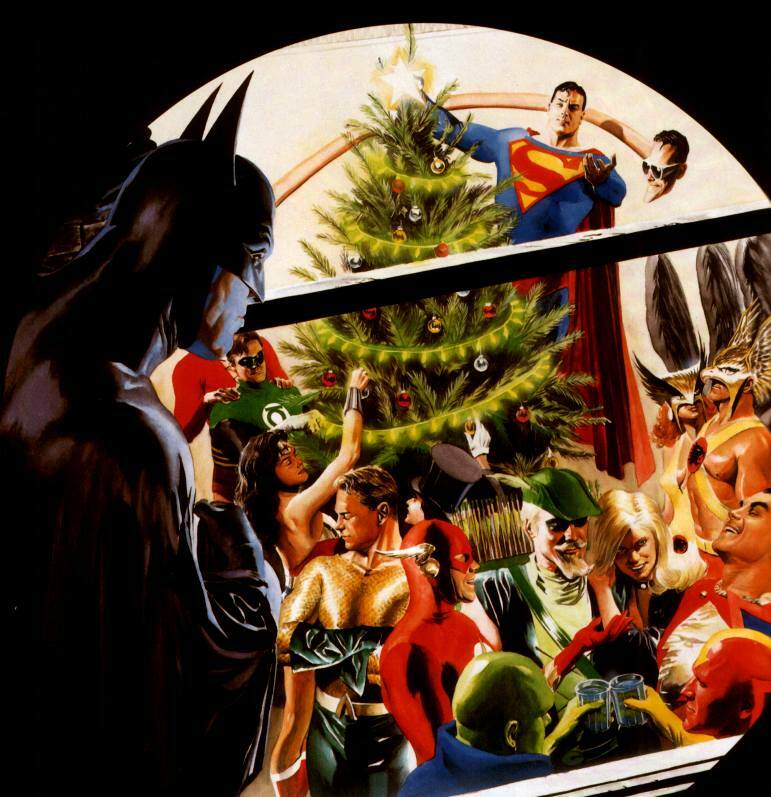 So, without further ado, we invite you to The League of Melbotis 2006 Holiday Spectacular! When: December 9th. Doors open at 7:00 PM. There will be a tree, lights, elves, a five-round cage match, and all the things you want out of an old-fashioned Holiday get together. And, I think if you ask, Jamie will play you a few Holiday tunes on her piano. Feel free to sing along, Steanso. We hope you can come (yes... YOU), so mark your calendar now. Also, if you have ideas, would like to provide a service for the party, or just generally want to be a busy-body, e-mail us to let us know what you have in mind. We will provide cookies, treats, a bit of food and some spirits for the occasion, but feel free to partake in the merriment by sharing in bringing some hooch of your own to be split several ways among attendees. So, Leaguers, get the Yule Log out of storage, fire up the cocoa and find your tackiest Christmas sweater, because we're ready to help you blow off some steam as you head toward the 25th. And remember, living outside of town is no excuse for not showing up. This evening Jamie and I headed down to the Bob Bullock Museum's IMAX theater for the final showing of Superman Returns, in IMAX 3D. I was a bit surprised to see the handful of people who also showed up, including one little Superman in his red cape (which, of course, warms The League's heart). It may have been my fourth time to see the movie, but it was Jason, Jackbart and Reed's first time, so I had tried numerous times to explain to Steanso (who loves his action movies) that this was not so much an action movie, and would not contain a lot of fighting. Anyway, it was great to see the movie again. But I also realize that I may be reading the movie a little differently than some of my fellow movie-goers. I like to think I'm fairly familiar with Superman, so maybe I'm reading too much into the movie, but I also think I'm allowed to stand by my reading of the movie. ESPECIALLY within the comics, Superman's powers and vulnerability to Kryptonite do not always follow some strict, mathematical guideline. It's one thing to say "Superman can lift tremendous amounts of weight". However, it's noteworthy that in his first appearances, Superman was lifting cars, but by the early 1960's was re-shaping planets from a sphere to a cubical shape to accomodate Bizarro (him do opposite of all earthly things...). Similarly, Superman's weakness to Kryptonite often takes him down for the count immediately, while other times it merely weakens him. It depends. I think what you have to know is that for many Superman fans, you don't put metrics on Superman. Superman is not about what you cannot do, he's about what you can do. 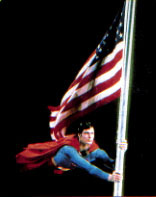 His powers, abilities and weaknesses ebb and flow with the story, changing to fit the story or to demonstrate that he's Super enough to overcome his weaknesses to rush to the rescue of the person/s he's fighting to protect (see Superman travelling through time in "Superman: The Movie" in order to save Lois). Just as Batman is a human who performs the impossible in the name of justice, so Superman is more than an arsenal of powers. He's a tall tale, a myth and an icon, both as a character and as a superhero. The point should not be: he can't do that. The point should be: He is Superman, and he can do what it takes to save the day, even if its the impossible. Especially if its the impossible, even for him. SPOILER LADEN COMMENTARY: "Superman Returns" is not about Superman battling Lex Luthor. It is about Superman combatting the knowledge that he is utterly alone in the Universe. After discovering his home planet is, indeed, wiped from memory. His isolation is heightened by his feelings of abandonment by Lois when he discovers she has built a family in his absence. It is the discovery that he has a son (see the seaplane sequence) and the confirmation that Jason is his son (see the Lois Hospital sequence) that provide him with the means to continue the never-ending battle, even as Luthor perverts and twists the one small token he has of his home world against both he and the world he's trying to protect. I read "Superman Returns" as a movie about a guy who discovers he is not alone in many ways (note the word "alienation" appears in the Scrabble game at the beginning), and does the impossible so that he can be there for both the ones we know he cares for and the ones he's learning to care for. If Superman suddenly lifts a huge rock of Kryptonite at the end of the movie, you can't say "well, he can't do that", you have to say "why can he do it? what's different now?" And if you aren't sure as to the beats in the story, check out the movie on DVD (coming in late November). After four viewings, I still like the movie. It's not perfect, but I think its a movie that I've picked new clues from with each viewing, and will continue to enjoy with more viewings. Aside from the movie, not much going on today. I'm still hip deep in long boxes as I prepare to put the comics in their future storage locale in my office closet. For good or bad, in doing my organizing, I uncovered about a long-box full of unorganized comics I'd quickly packed before leaving Phoenix. Jamie is going to the comic shop with me now on a weekly basis, which is great fun, but I am waiting to see if she discovers some comics she wants to read all on her own. We don't need to spend the extra money, but I am curious to see what titles she gravitates towards. So far, Wonder Woman, some Teen Titans, she seems to pick up some 52, but I think Ultimate Spider-Man is still one of her favorites. Should I introduce her to Firestorm? Some other "kid on the learning curve" book like Blue Beetle? I'm not sure. I don't read enough Marvel to make comment, and I don't get to spend enough time at Austin Bookms to direct her toward any indie comics. I just finished voting. Due to a clerical error, Jamie was re-registered to vote at our prior Austin address. Go figure. I'm still giddy at taking part in the democratic process. The League is no fan of the sort of music which usually populates the Country Music Awards. We are, however, terrific fans of schadenfreude. See Faith Hill's reaction to Carrie Underwood winning Female Vocalist of the year. I don't usually post twice in a 24-hour-cycle anymore, but I thought you guys at work might enjoy this. An abbreviated post this evening. I have long-delayed/ neglected things to attend to, such as bagging and boarding comics, putting comics in boxes, transporting all boxes upstairs to newly completed office. Tomorrow is mid-term election day. If you're registered, go vote. 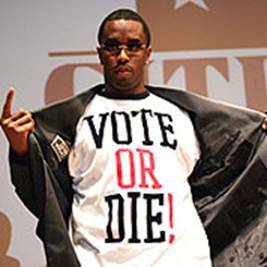 One may wonder what apocalyptic vision Diddy experienced which presaged the launch of the "Vote or Die" campaign. Ah, well. Despite the fact that I find all four of the nimrods running for governor in the State of Texas to show no signs of actual leadership, I, too, shall be going to cast my vote for the earthling I find the least offensive. I have never been an 11th-Hour undecided voter. I've always believed you had to be sort of goofy not to have a firm idea as to whom you would vote for pretty early on, but I guess that makes me sort of goofy. I made my decision earlier today, so I am going to vote on that and on some bond issues. Some guy named "Fred Head" is running in a nearby election. I almost jumped out of my car and stole his sign off the side of the freeway. I'm voting now while I await the steely might of our coming Robot Overlords, who shall remove the democratic process as they make all decisions for us with their infallible binary logic. Oh, how nice. Lucy just came in here, said hello, yawned, then went back to bed. Due to the incompetencies of the very NON Six Sigma State of Arizona system and my insurance carrier, Jamie had to delay her sleep study. She is sleeping soundly somewhere upsatirs rather than in a room in North Austin with wires attached to her head. LEAGUE HOLIDAY SPECTACULAR 2006: We're Thinking December 9th. Mark your calendars. I think I've given you Leaguers plenty of stuff to chew on over the weekend, so I hope that you've once again stuffed yourself to the gills, fattening yourself on my infotainment as you've sucked my spirit dry once again. Here's an item: I don't know if you're watching Tina Fey's new NBC show, 30 Rock, but last week's episode featured a bit about Six Sigma. Yes, there is a GI Joe toy line called "Sigma Six", but Six Sigma is not quite what was depicted in the show, which would lead you to believe its about a boss being a busy body. Just wanted to clear that up. Its more of a statistical anaylsis process intended to find sources of inefficiencies in manufacturing that's been spun out as a philosophy on how to run a business, in general. Also, I think Fey's "no comment" on "Studio 60 on the Sunset Strip" in her Onion AV Club interview is sort of telling. This weekend we were lucky enough to have Unky B and Tia Linda come in from Virginia. They headed into Houston first where Linda got to hit an international quilting conference/show. I'm not into quilts, per se, but The League thinks we can identify with her school-girl giddiness regarding the quilts. While not in the same arena of trash/disposable art as comics, quilting is an artform of depth and complexity, and (like comics) the folks who are into it are probably also aware that their interest may be a bit nichey. So, this was sort of like Comic-Con International for Tia Linda. If The League were to go to Comic-Con International, Leaguers, you would most certainly see a display of unbridled school-girl-like giddiness. Saturday Unky B and Tia Linda arrived here with my folks about 1:00pm. KareBear had picked up a brisket at a church fundraiser, so we got some good meat and some sides and got to basically sit around and chat for a few hours. Saturday night we met up with some family friends going way back, and had a probably very expensive dinner. I got a few score updates throughout the evening, but mostly missed the UT game. We got in a little more face-time with the out-of-towners at the All Steans end of the table. I saw the last 60 seconds of the A&M/OU game, but was in bed and out like a light by 11:20 thanks to a combination of: staying up too late getting the house prepared for a visit, coming down from an all-day caffeine overload, and a few glasses of wine. This morning we got up, had some Cheerios and awaited the family's arrival. We visited, had lunch and then Unky B and Tia Linda went back to Houston. C'est la vie. The good news is that we got to see them this fall, despite the fact our holiday plans are not converging. We TRIED to find a movie this afternoon, but Borat was predictably sold-out, I couldn't muster the energy for Flushed Away, and didn't feel like much better about Running With Scissors. So we didn't do much of anything this afternoon, which was okay. Having had The Admiral foot the bill for three meals this weekend, we took our spare money and hit Romeo's for dinner, which was uncrowded and pleasant enough to sit outside. Watched the taped VH1 movie "Totally Awesome", which was not totally awesome and made me sort of yearn for "Not Another Teen Movie". I thought Jason had a pretty good insight over the weekend when he pointed out (while watching CNN) that America has sort of slowly embraced Saddam as a loveable loser. Nobody seems to much care anymore about his crimes against humanity, etc... He's just the dude in the sport coat and beard on trial every day. I don't think anybody is going to miss Hussein, but his mustachioed face of malevolence has sort of been displaced in the American mind for a while now by the spectre of faceless terrorists and our desire to sort of forget the reasons behind going into Iraq. The League and Steanso were spit-balling and sort of wondering what was going to happen if Hussein were to be acquitted. I mean, just as a sort of intellectual exercise. What would the world have looked like this morning if the court had failed to convict Saddam..? ...and what can you say about our friend, Haggard? Quite a bit, I assume, but I don't have the energy. Tomorrow Jamie will be partaking in a sleep study to try to overcome her migraines. Apparently migranines can be affected by things like sleep apnea, so she's heading out tomorrow night after dinner to get hooked up to all sort of interesting devices that will, I assume, measure her theta waves. Hopefully, it will not end up like this. Then she is off next weekend for sunny Lawton, Oklahoma. This means The League will be flying solo (translation: going to Austin Books and looking for New Gods back-issues). Book yourself now for League solo-adventures. It's like I was popular enough to get my own mini-series.